Standing in the centre of the Belarusian capital on July 3, you will see the soldiers of the Guard of Honor squadron marching through the streets of Minsk. You’ll hear tanks and self-propelled artillery mounts roaring towards the Kurgan (Mound) of Glory and watch the combat super jets tearing up the sky. Belarus is celebrating its Independence Day – the country's national holiday. It is not that the celebrations happen with such fanfare every year. 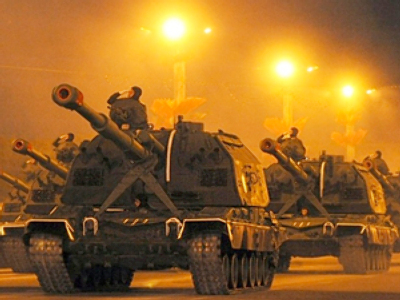 Last time Belarusians saw similar festivities with super jets and fireworks was 5 years ago. And nobody expected to have anything special this year. Among the Minsk authorities and military commanders, there were talks about giving up the idea of bringing any armored vehicles to the event. However, in the end, Belarus has shown everything it could. People in the streets wondered why the country should commit to such spending amid a very difficult economic situation. Add to the expenses the huge sums of money to be paid for restoring Minsk’s roads, heavily damaged by the truck-type vehicles. Another peculiarity of the 2009 Belarus Independence Day is the unprecedented security measures – the echo of an explosion on the same day a year ago, which took place some 50 meters from President Aleksandr Lukashenko. However, the large scale of the celebrations and the impressive media campaign that preceded the event – all at a time when the country faces serious financial problems – shows that the Belarusian leadership did not regard it as something to skimp on. The history of this Day is not like in any other country of a former Soviet state, where "independence" means independence from the USSR. On July 3, 1944, the divisions of the First and Third Belarusian Fronts of the Soviet Army liberated the Belarusian capital, Minsk, from German troops. The group of armies regarded as the "Centre" of the German Wehrmacht had almost completely been destroyed. So here, "independence" is first and foremost about the liberation of the country from the Nazi occupation: the "liberation day". But that is now. In fact, 14 years ago, Belarus was on the bandwagon – the holiday was celebrated on July 27, the date in 1990 when the country’s Supreme Council declared its independence from the USSR. However, when, in 1996, people were asked in a referendum (when the notorious Lukashenko amendment of the Constitution was also accepted) whether to move the celebrations of the Independence Day to July 3, around 88 per cent agreed. Was it a successful publicity stunt or something expected in this small post-Soviet country? We cannot find out without looking deeper at the history of the WWII and what it means for Belarus. Of course, it is quite reasonable that Belarus, which lost more than a quarter of its population and half its national wealth in the Great Patriotic War, moved its Independence Day to the day of "liberation" from the Nazi aggressors. But it is not just the memory of their ancestors’ tragedy that makes July 3 significant for present-day Belarus. After the war’s end, the Belarusian Soviet Socialist Republic became one of the co-founders of the United Nations Organization, in the manner of an independent state and as an equal to the others (only one other republic of the USSR – Ukraine – got the same honor). That was the first time when the Belarusian nation became a participant in international politics in the form of a state, with the word "Belarusian" in its name. Before that, it had been nothing but a part, a subject, of other, greater state entities – the Grand Duchy of Lithuania, Rzech Pospolitaya and the Russian Empire. Another important factor is that WWII completely transformed the country’s landscape. Before the war, Belarus was mainly an agrarian country with underdeveloped industry, working mainly on local raw materials. However, after 1945, the country’s completely ruined economy was rebuilt into an advanced industrial complex with dominant machine-building, automobile, metallurgical, chemical and petrochemical industries. This transformation overwhelmingly changed the region’s landscape, making Belarus the "sborochny tseh" (assembly room) of the USSR, and a major consumer of raw materials produced thousands of kilometers away from the country’s borders. Besides this, the industrialization set off the process of the active urbanization of the country, in which now around 72% of the population live in the cities. Another fact in favor of July 3 was the demographic transformation of post-war Belarus. Before their Victory Day, the Belarusian people had always been divided into culturally-different population groups. From the 15th century, the country was dominated by a mainly Catholic and Protestant elite, while most of the population was Orthodox or Uniate. This state of affairs didn’t change even in the Russian Empire, as the ''jail of the people'' preserved many of the local customs and "poryadki" (order, way of things). The Second World War, and the fierce guerilla war on the territory of Belarus in 1941-1945, almost completely destroyed the elite groups of Belarusian society. As a result, after the victory, the BSSR was headed by a new, partisan elite, comprised of former peasants, workers and soldiers. It is also worth mentioning that in 1996, when the Belarusians decided on the date of their Independence Day, the then-holiday (July 27), which marked the 1990 Declaration of Independence, was deeply associated with the degradation and poverty of the early 1990s. So by choosing the “neo-Soviet” identification, Aleksandr Lukashenko showed his most brilliant intuition. Maybe it is this choice that has helped him maintain his legitimacy for many years since. Anti-Nazism is a substantial part of present-day Belarus. Actually, the Soviet heritage is the core of the state ideology, and is directly promoted through the Ideological Department of the President's Administration. However, having taken up the methods of ideological work, Belarusian statesmen didn't care much about the contents. As a result, according to many opinion polls, today's Belarusians do not know much about the victory of 1945, and have no deep understanding of its meaning. Most people think that July 3 is only an extra day off. Some Belarusians say that it is a day of commemorating the heroes of the past. Rather few can explain what exactly Independence Day means. Analysts say that there are tough challenges for the country. Trying to build closer relations with Europe, Belarus is getting involved in an Eastern-European cultural context, with its associated Russophobia, hatred of communism and tolerance, if not sympathy for, Nazism (which is especially characteristic of Ukraine, Latvia and Estonia). This conflict of values threatens to break the ideological unity of the country, which will inevitably undermine Aleksandr Lukashenko's legitimacy. The Belarusian leader clearly understands these trends, and that is probably why he used July 3, 2009 to take some steps toward reconciliation with his Russian partners, saying that the partnership with Moscow is above all the milk and whatever other rows. So it looks like Independence Day is gaining more significance, not only for the past and present, but also for the future of Belarus, and maybe the whole of Eastern Europe. Moreover, the ideological struggle may soon become an important factor in defining the geopolitical realities of the region. And it is critical that Russia uses this field to build up its influence here through a strong international anti-Nazism coalition, consistent with post-WWII European values, and based on different ethnic and social groups' involvement in the Resistance movement.